Indonesia’s luxury wilderness resort, Nihi Sumba – which has been voted the best hotel in the world in all categories by Travel & Leisure readers for the past two years consecutively – is the latest addition to World Resorts of Distinction’s (WRD) stable of world-leading resort brands. CEO, Tess Willcox, said the resort operates according to a responsible luxury ethos that makes it a complementary fit for WRD’s collection of likeminded properties around the world. 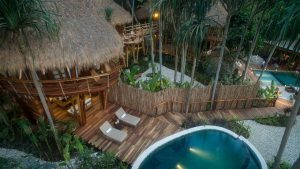 “Our goal is to transform the tourism industry by working with resorts that are pioneering the conscious travel space and Nihi Sumba is one of the first names that comes to mind in that regard,” she said. Located 400 kilometres east of Bali on Indonesia’s most unexplored island, Sumba, the resort is easy for Antipodean travellers to access. “Most metropolitan airports in Australia and New Zealand offer direct flights to Indonesia and there are three flights per day from Bali’s Ngurah Rai International Airport in Denpasar to Sumba Island’s Tambdaka Airport,” Tess said. Nihi Sumba was originally developed as a surf resort to provide guests with access to the region’s most sought-after waves. Today, as the brainchild of American entrepreneur, Chris Burch and South African-born hotelier, James McBride, it has been reborn as a luxury resort with a conscience, featuring 27 pool villas built in the traditional Sumbanese style; set on 467 acres of tropical forest, rice terraces and grasslands wrapped around the stunning 2.5 kilometre long Nihiwatu beach. Nihi Sumba has evolved into one of the most coveted resorts in the world and is an example of a sustainable operation in harmony with the environment and the Sumbanese people. According to Tess, it is a soulful destination, where rugged meets unregulated freedom: “If travellers are looking for a place to unplug from their hyperconnected lives and connect with earth and community, this is definitely the place,” she said. 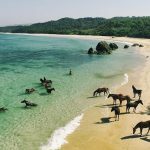 Guests can enjoy horseback riding on the beach, private surf breaks, spa safaris, and signature excursions including visits to local Stone Age sites, picnics under waterfalls and treks along butterfly trails. 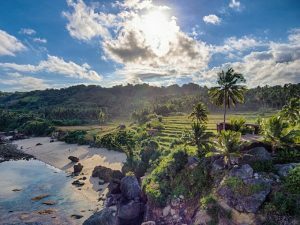 Additionally, there are plenty of opportunities to experience Sumba’s magnificently preserved ancient culture on the island, such as trips to local villages to see traditional arts and crafts, megalithic burial sites and exquisite Ikat weavings. The most rewarding experience of all, however, is visiting the Sumba Foundation, which was founded in 2001 to help alleviate the crushing burdens of poverty the locals were living under, by focusing on water, health, education and economic projects. Key achievements include treating 407,000 patients across four clinics; reducing malaria rates by 93% in core project areas; developing more than 65 wells and 260 water stations; and supplying water, toilets and supplies to 22 primary schools.